This spring, when Harry Reid announced his retirement from the U.S. Senate, he could have picked any number of rhetorical flourishes. He could have gone full statesman, à la George Washington. He could have shivved his old bête noire, Republican Senate Majority Leader Mitch McConnell. He could have again insisted, for the hell of it, that Mitt Romney didn’t pay taxes for a decade. But Reid, as they say, threw a curveball. Reid had deployed a baseball metaphor. And a rare, bipartisan caucus decided the metaphor was … really good. “That’s about the most articulate thing I’ve ever heard from Harry Reid,” the conservative writer Charles Krauthammer told me recently. Did you have any 42-year-old DHs in mind when you came up with that line? I asked Reid. 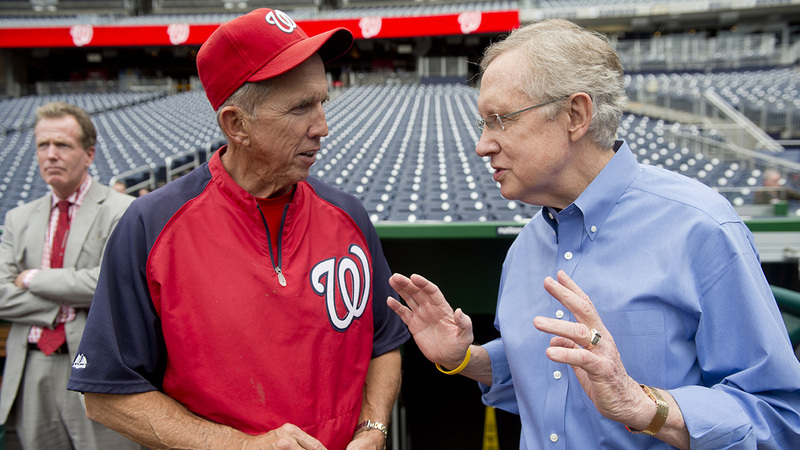 When Reid ventured a baseball metaphor, he joined one of the few unbroken traditions in American politics. During Abraham Lincoln’s 1860 presidential campaign, a political cartoon cast Lincoln as a “run” and his three opponents as “outs.” Warren Harding asked the American public to “strive for production as Babe Ruth strives for home runs.” At an exhibit at the George W. Bush presidential library in Dallas, great baseball metaphors of the POTUSes are painted on the walls as if they were choice cuts from the Gettysburg Address. Some baseball metaphors, like Reid’s, transcend mere filler. They’re fiendishly clever or awfully strange and help us understand the labyrinthine world of politics. And some baseball metaphors — as McConnell was saying on the Senate floor that day, about a slightly different subject — constitute a “threat that is literally impossible to overstate.” These metaphors are the cheapest form of rhetorical base-covering — or, in some cases, a complete whiff. Indeed, when Bernie Sanders challenged Saudi Arabia to “step up to the plate” and fight ISIS on Real Time With Bill Maher last week, the phrase was so boilerplate that it hardly registered as a sports reference. Last May, an anonymous Obamaite told Haaretz that Martin Indyk, the former ambassador to Israel, was waiting “in the bullpen” for the peace process to restart. You got the gist even if you had never heard of Indyk, or had no sense of the current state of Middle East diplomacy. The football metaphor — the fourth quarter; moving the goalposts — will probably one day surpass the baseball metaphor. Even Reid once compared the Republican leadership vacuum to the Jets quarterback situation. But for now, baseball metaphors reign supreme. The first reason is that the Senate is a permanent gerontocracy. Reid is 75 — old enough to remember when his beloved Indians won the ’48 World Series. (He has since become a Nationals fan.) When we met, Reid hadn’t watched the NBA Finals. He refuses to go to Redskins games or even utter the name “Redskins.” But he dips into a baseball game on TV just about every night. His only gripe focuses on late start times on the West Coast. Of course, much of it is fraudulent. Harding was trying to barnacle himself to Ruth, an American hero who was a lot more popular. If it’s not the ninth inning, it’s the first. “We’ve had, if you will, the first inning of a game that has, let’s say, 50 innings in it,” Mitt Romney told supporters after finishing second in the 2008 Iowa caucuses. This was an awful baseball metaphor. It made the primaries seem like Pawtucket-Rochester in 1981. Moreover, the binary choice between the first and ninth innings (with the occasional “we’re going into extras”) makes you doubt how much thought politicians put into their metaphors. Nobody says, “It’s the middle of the fourth, and we’re looking at a rain delay of a few hours” — even if that’s what Obama’s second term has felt like. As they say, it’s a long season. 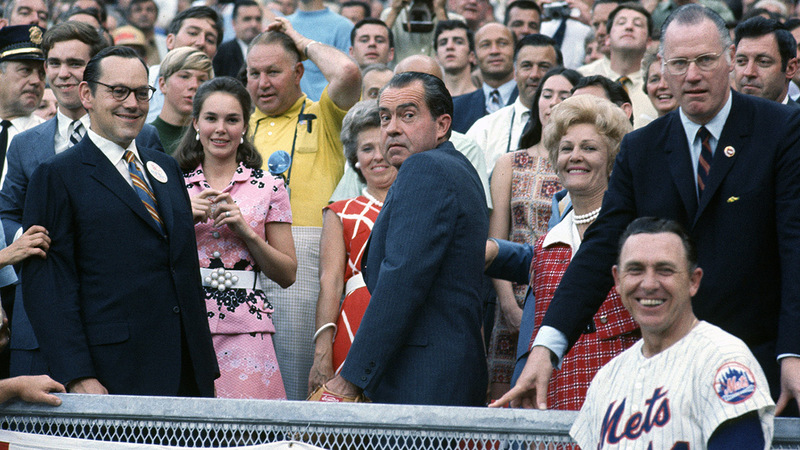 Nixon: In baseball terms, do you remember George Bush was a first baseman, captain of the Yale baseball team? King: But he didn’t hit very well. Nixon: As a matter of fact, the scout said, “George Bush, good glove, poor bat.” Now, how has he done as president? Well, as far as his glove is concerned, it’s a golden glove. He made very few errors, so we have a great golden glover as far as the president is concerned on the defense. And the other point that we should bear in mind as far as batting is concerned, he is hitting over .500 a day. As a matter of fact, according to the polls, he’s hitting around 70 to 75 percent. Before the 2000 Democratic primaries, Al Gore tried to goad Bill Bradley into having more debates. “What about it, Bill?” he asked. If Mark McGwire and Sammy Sosa “just stayed in the dugout … and didn’t step up to the plate, they wouldn’t hit many home runs.” This baseball metaphor was both a pander — McGwire and Sosa were still Ruthian icons then — and an attempt to lure Bradley into a trap. Gore, of course, wanted Bradley to strike out looking in their debates, which Bradley mostly did. Barack Obama is the most sports-metaphor-mad president the country has ever known. His metaphors range from baseball to basketball (ISIS is a JV team wearing Lakers jerseys) to football (“We don’t need to spike the football”). Obama, as they say, hits to all fields. “All the baseball metaphors — and sport metaphors generally, I would say — that have come out of his mouth have been ad libs,” said Jon Favreau, who spent four years as Obama’s director of speechwriting. Last April, in Manila, Obama dropped the baseball metaphor that would become the most controversial of his presidency. ISIS was gathering strength in Syria; the Russian army had its fingers in Eastern Ukraine. How could the U.S. military keep the bat on its shoulder? 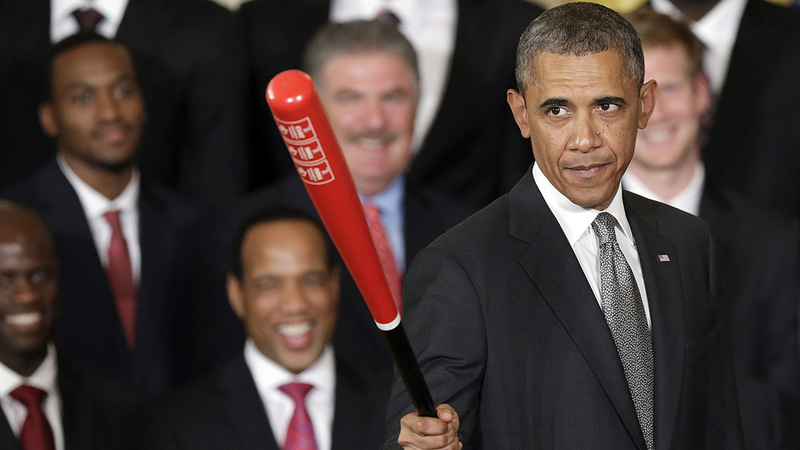 “You hit singles, you hit doubles; every once in a while, we may be able to hit a home run,” Obama said. “He doesn’t like to get his jersey dirty, put it that way,” Chaffetz told me. Notice how Obama reframed his modest approach. He was no longer saying he wanted to be a singles hitter, which sounded unambitious. He was saying he wanted to have a good eye, which was unimpeachable. Someday, if history is kind, this will be known as the Joey Votto Doctrine. In 1983, Japanese prime minister Yasuhiro Nakasone tried to convince his patron Ronald Reagan to let Japan bulk up its country’s military. “You be the pitcher, I’ll be the catcher,” Nakasone said. 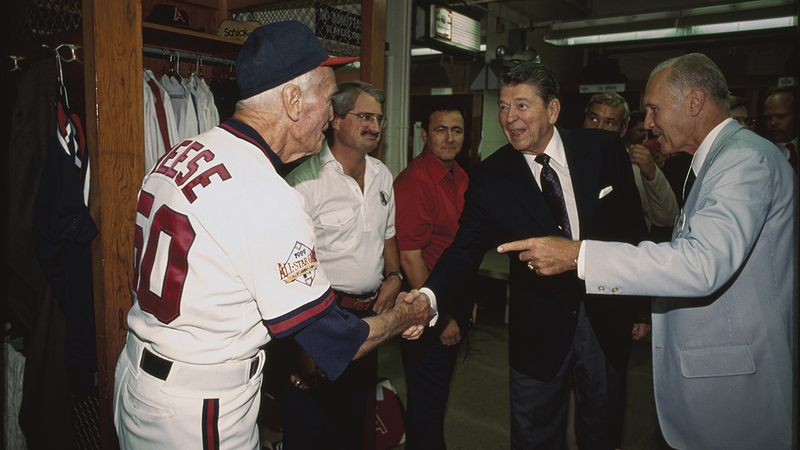 “But once in a while, the pitcher must listen to the catcher’s good advice.” Reagan allowed the buildup. But you are in a very different position as a Supreme Court justice. As you pointed out, some places of the Constitution define the strike zone. … The strike zone is set out. But … you said unreasonable search and seizure. What constitutes unreasonable? So, as much as I respect your metaphor, it’s not very apt, because you get to determine the strike zone. That’s a more accurate accounting of a justice’s job, but we’re still painting the corners. The most poignant use of the political baseball metaphor — one Harry Reid hinted at — is to convey exhaustion. American politics is so soul-crushing, so riven by procedural horseplay, that sooner or later it reduces everyone to a 42-year-old DH. “You know how I really feel?” Franklin Roosevelt said in 1945. 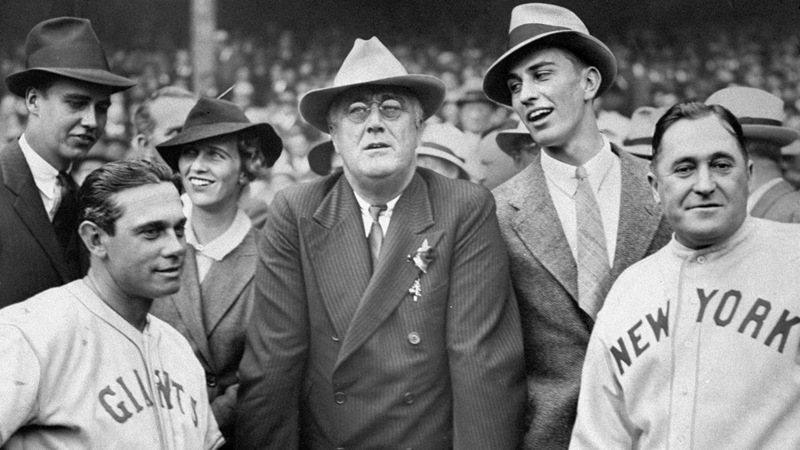 “I feel like a baseball team going into the ninth inning with only eight men left to play.” Eight days after uttering that line, Roosevelt was dead. The baseball metaphor attains a certain pathos when it hints at the end of a career. 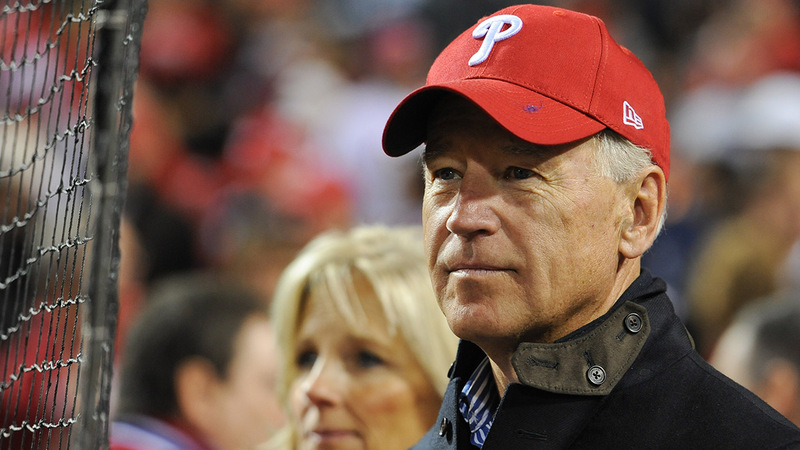 “In baseball, when they say you’re out, you’re out,” Gerald Ford said in 1975. “It’s the same way in politics.” A year later, Ford was out. When I visited Reid, he had just spent a chunk of his day mired in a debate over the McCain Amendment to Invoke Cloture on HR 1735. “I cannot imagine why the Republican leader is doing this,” he said on the Senate floor. “It makes a mockery of the legislative process.” His voice didn’t rise to match the outrage of his words. A few minutes later, Reid walked back to his office with shoulders sagging. If you squinted, you could imagine Jim Leyland trotting to the mound for the last time. In fact, A-Rod will turn 40 in July.